Well, we all want to call it the 70-200 VR III, since it replaces the Nikon 70-200 f/2.8G AF-S VR II. But the new lens is officially the 70-200mm f/2.8E FL ED AF-S VR. It is most definitely a different lens; it’s 22 elements include one fluorite, one high-refractive, and six ED elements, along with new coatings. There’s also fluorine finishes on the front and rear elements to prevent smudging. I’m not a fan of this in general (they seem far more prone to coating scratches), but some people are. Not to mention it has electronic aperture control (of which I am a fan). And, of course, an improved 4-stop VR system. So most of these improvements are things you’ll need to find out about in lens reviews, which this isn’t, if you’re considering upgrading to this lens with it’s Sonyesque $2,800 price tag. I’m just here to tell you how it performs on an optical bench, what it’s resolution is, and stuff like that. Maybe in a few weeks, we’ll take one apart and look into that ‘improved weather sealing’ claim. But for today, we’re just going to look at the optics. I’m quite interested in how this lens performs. The VR II was an exceptionally good lens at 70mm, really rather weak in the middle of the zoom range, and then got superb again at 200mm. 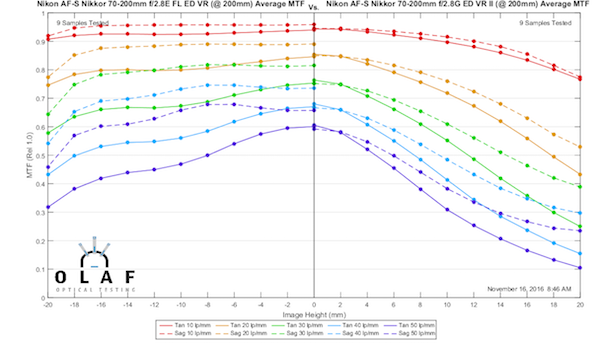 Nikon’s marketing department is waxing poetic about the improved optics of the new version, so I was pretty eager to see these poetic MTF curves for myself. 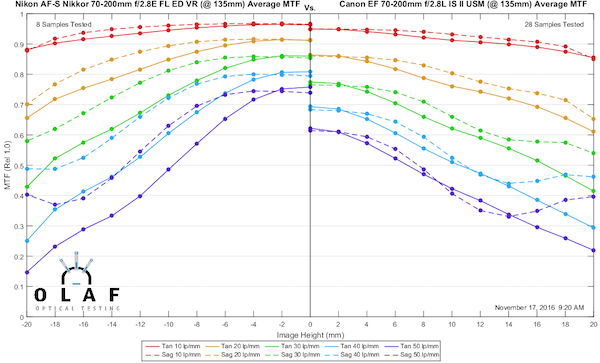 To make things simple from the start, I’ll compare the MTF curves for the new FL lens on the left to the MTF curves of the Nikon 70-200mm AF-S f/2.8 G VR II lens on the right. The 70-200mm VR II was at its best at 70mm, and the new lens is even better on the MTF bench, although just a bit. I doubt that anyone is going to notice much difference in their photographs, but they might see improved corner sharpness. The 70-200mm VR II was at its worst at 135mm, and the new lens just mops the floor with it in the middle of the zoom range. It’s not just hugely sharper in the center; it’s sharper 2/3 of the way to the edge of the image than the old one was in the center. Now I know a LOT of people use their 70-200mm lens just as a 200mm lens, but honestly, if you ever visit the middle of the zoom range, you will notice this difference. It’s night and day. The VR II was quite good at 200mm, particularly at the center. The new FL lens is perhaps a bit better in the center, but it maintains its sharpness much better as you go away from the center. Maintaining sharpness this well away from center is pretty amazing for a zoom lens. 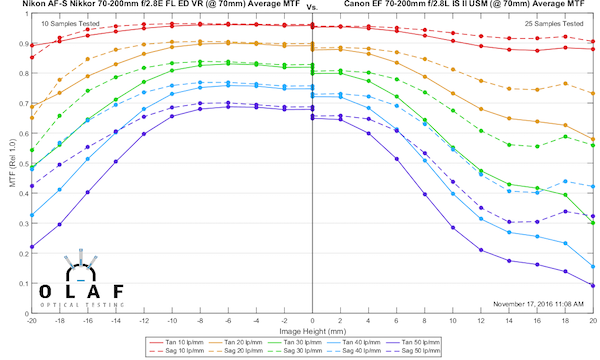 I’m going to have to talk about this MTF curve a bit, because you may have noticed that the sagittal and tangential curves (dotted and solid lines) aren’t quite together in the center of the FL lens, which is unusual. The reason, in this case, is a bit of ‘off-centering.’ I’m not going to use the word decenter, because that implies optical decentering, which this isn’t, exactly. Rather the sharpest point at 200mm is, for most copies, not quite at the center of the image, but just a few mm (in sensor distance) from the center. So technically, all of the 10 copies we tested were very slightly decentered at 200mm. But we usually think of decentering as causing a soft image, and in none of these lenses could the image be considered soft. It’s rather that the area of maximal sharpness was just a bit away from the center. Because the sharpness is maintained so well from side-to-side, I very seriously doubt anyone could find that the center was a bit off-axis in a photograph in any of these ten copies. That doesn’t mean there aren’t going to be some that are significantly decentered at 200mm, though, because lots of lenses made. But again, decentered or not, they were all just damn sharp at 200mm. I wanted to post the field-of-focus curves, for those of you who are interested in the geeky stuff, to show just how flat they are. Again, this would be good in a prime lens, but for a zoom they’re pretty spectacular. This is one copy, but a very typical copy. And yes, most had a very slight field tilt at 200mm, but little or no tilt at shorter focal lengths. Again, you can harp on the negative, but for a zoom, this less field tilt is less than we expect to see. Yes, I hate myself for doing this but if I don’t someone is going to dig up old results and do it anyway. What follows is a comparison of the Nikon 70-200 f/2.8 FL VR to the standard bearer of 70-200 f/2.8 lenses, the Canon 70-200 f/2.8 IS II. The new Nikon is a tiny bit better in the center but definitely is a bit better off-axis in the middle frame at 70mm. 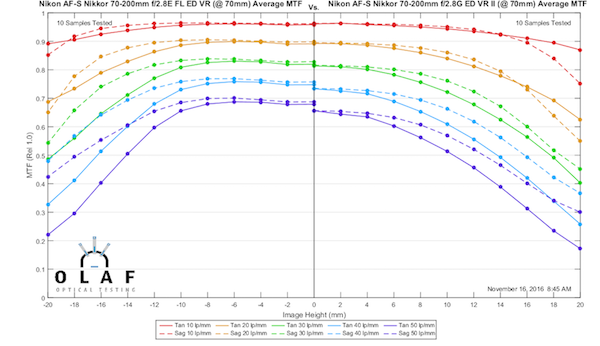 This demonstrates just how much of a difference Nikon has made in the middle focal range. The Canon was clearly better than the Nikon VRII, while the Nikon FL is clearly better than the Canon. Despite the oddity in the Nikon 200mm graphs, I think the Nikon is clearly a bit better at 200mm. As always, let me emphasize this is ‘lab better.’ Actual photographs with all of the variables that introduce, I doubt the difference at 70mm or 200mm would be of any visible significance. At 135mm, though, I think they might be. And as always, this has been an MTF test; it was only an MTF test. Had this been an actual photograph you would have been instructed that all differences were simply because of poor technique. I don’t read MTF charts enough to know off hand if they’re always done at a specific f/stop or opening diameter, or specific DoF? Maybe I’m blind, but I can’t find the f/stop used mentioned anywhere… Also, is this at infinity? How do they vary with focal distance since I assume they’re all internally focused? Hey Roger, have you had a chance to get one apart yet? I’m really curious to see if it lives up to Nikon’s claimed level of weather sealing. The f4 version of the Sony lens was even worse. So twice the likelihood of something going wrong and errors. Well done Sony! 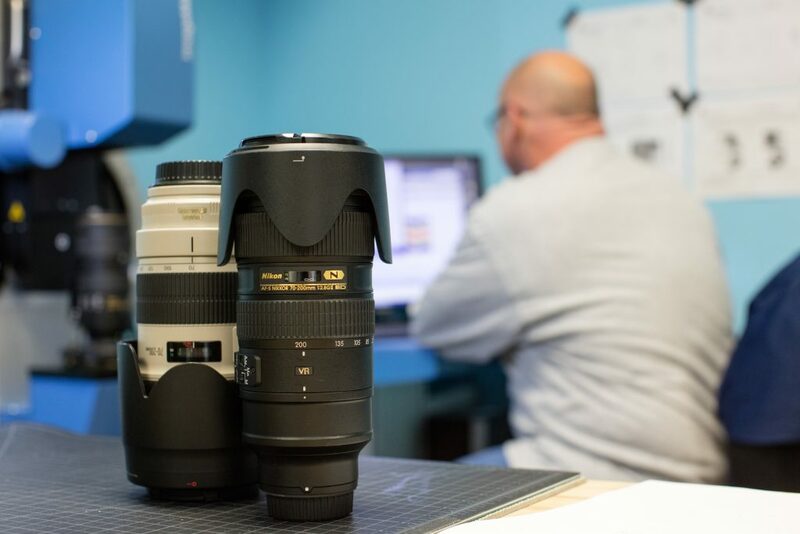 Are you planning to review the Tamron 70-200 G2 and make the comparison between these two lenses? That’s correct that Canon offer several different levels of precision in their AF sensors, and I know from experience with the 1D Mk III that I owned back in 2007, that their AF system routinely uses information from more than one level of detector. Reading into the description you found, I would take it to mean that the final focus movement based on the high-precision detector – once near-focus has been achieved with the low-precision detector – is done open-loop. This is reasonable, as the movement needed at that point would be very small, high detail is available to the detector, and the calculation can be done with sufficient precision. There must be a final point which the system arrives at, which it deems “good enough” that no further refinement is of value. Relying on the high-precision detector to determine that point makes sense. 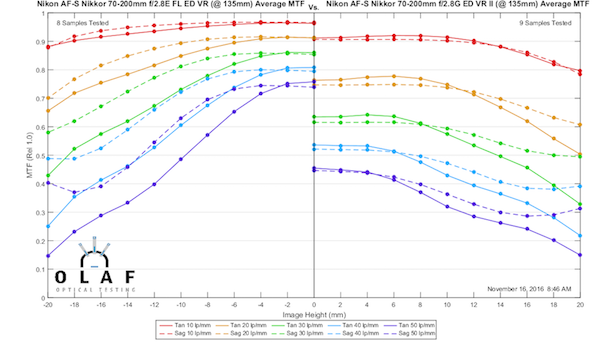 Nikon have not yet produced an AF system with more than one level of detector precision – other than a small modification which “stretches” some of the f/5.6 detectors to see into the f/8 circle as well. On a slightly different topic, the reason why AF fine tuning is needed, has nothing to do with the servo loop operation. It is down to second-order optical effects such as aberrations and distortion. The AF optics have no “zoom” capability to accommodate variations between lens designs such as exit pupil distance, and distortions inherent in wide-angle lenses cause difficult design issues for the AF system. The AF system uses a parallel optical path which must be artificially aligned to “sync” to the behavior of the imaging path, and due to compromises in its design, there will be discrepancies which are sometimes significant. Exacerbating those difficulties, is the fact that optical elements used in the AF module are low quality molded plastic exhibiting high levels of CA and spherical aberrations. All things considered, it is amazing that PDAF can work as well as it does. Marianne, I have enormous respect for you, based on the remarkable competence and intelligence evidenced in your posts on DPreview over the years. When you write something, I thus sit down and take notice, as it’s quite clear to me that you’ve got what it takes to back up what you write. In this case, I humbly submit that we might *both* be correct, in the sense that a modern DSLR might be performing both closed-loop and open-loop AF. shows that the AF variance of many (most ?) Canon DSLRs is higher than what you can achieve using contrast detect of careful, live-view manual focusing. Closed loop control is essentially a process designed to measure and /eliminate/ errors. The fact that, when pixel-peeping hi-res images, there’s a significant residual, uncontrollable variance — i.e. random residual error — in the focusing results of many Canon DSLRs would seem to indicate that the “measure, minimize / eliminate, repeat” looping part required for high-precision focusing doesn’t seem to exist on many Canon cameras, and that therefore, the system should rather be called “open loop”. Nikon-brand cameras, of course, might be behaving differently. PDAF servo is closed-loop. Period. Without that, the camera would be unable to detect subject movement during focus, which modern PDAF systems are designed to do, even in single-shot or non-servo mode. Further, anyone who has carefully observed the focus-drive behavior that occurs during repeated testing, knows that additional movements can and often do occur to further refine focus after the initial movement. No controls engineer (which I have been for several decades) in their right mind would intentionally forego valuable information which can be so easily obtained while the focus group is moving; one does not place a powerful processor into a long wait loop when there is useful activity it can perform. 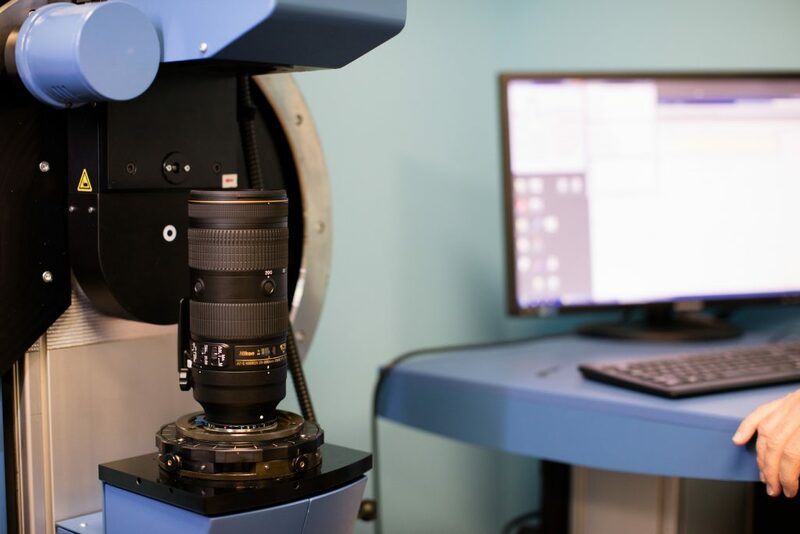 Finally, in the case of large initial mis-focus, it is implausible that any PDAF system could initially arrive at a sufficiently accurate value for the lens command, due to blurring of the images at the AF sensor. 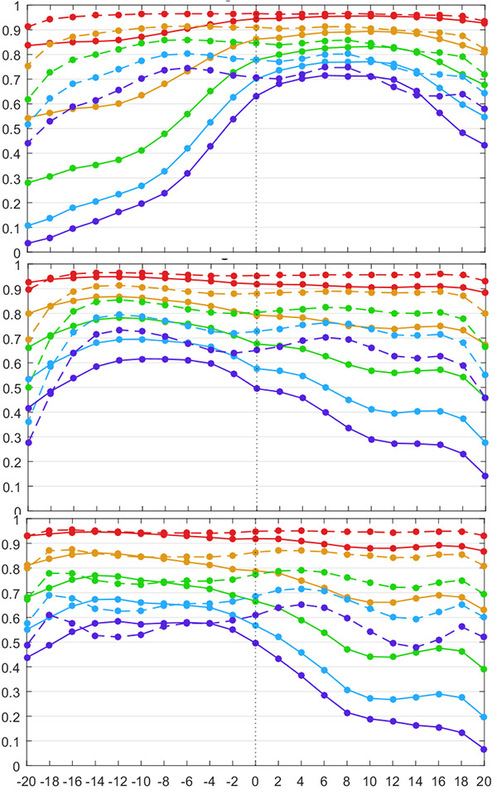 The existence or non-existence of an AF micro-adjustment feature is an entirely separate consideration, with no bearing on the control law design other than to add a bias to the error term. Would love to see how the new 70-200 stacks with various TCs. 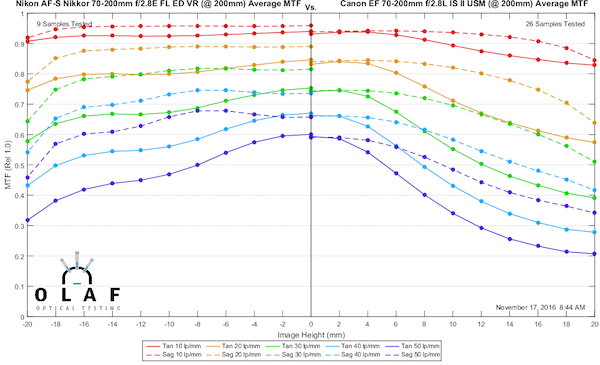 I’m most curious to see how the 70-200E + TC-20E III compares to the 80-400 or 200-500. Have a LINK to that MTF ? at 200mm f2.8 somewhere ? Do you have a rough ETA on when the comparison might be posted? When reaching out to Sony what have they said about the long delay?